We offer mulch, bark, wood chips, and compost delivery at the best prices in all of San Diego. Our pricing is up front and you pay after the material is delivered. See below for our pricing. Delivery fee starting at $75 for up to 15 cubic yards. 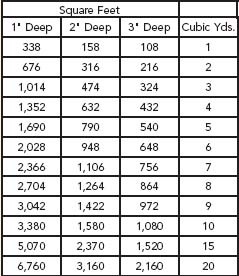 Below you will find a chart that will hep you determine how many yards of material you'll need to cover the given space.